Welcome Back! Or should I say “bon retour parmi nous” That’s right just give it another week or so and I might actually have a sentence or two for you! Well the day has been and gone yes that’s right I’m talking about Valentine’s Day. All of us guys are letting out a big sigh of relief, come on now admit it your glad it’s only one day and it’s over with, Well for another year anyway lol. So where are we, Well it’s half term again! So having to entertain the little people, Well that’s why we have Xmas so Santa can bring them a playstation I guess, So just jumping on the computer for a bit just for you guys. Well it only seems like 5 minutes since the little people were last off, Did I ever get this amount of holidays when I was a little person? 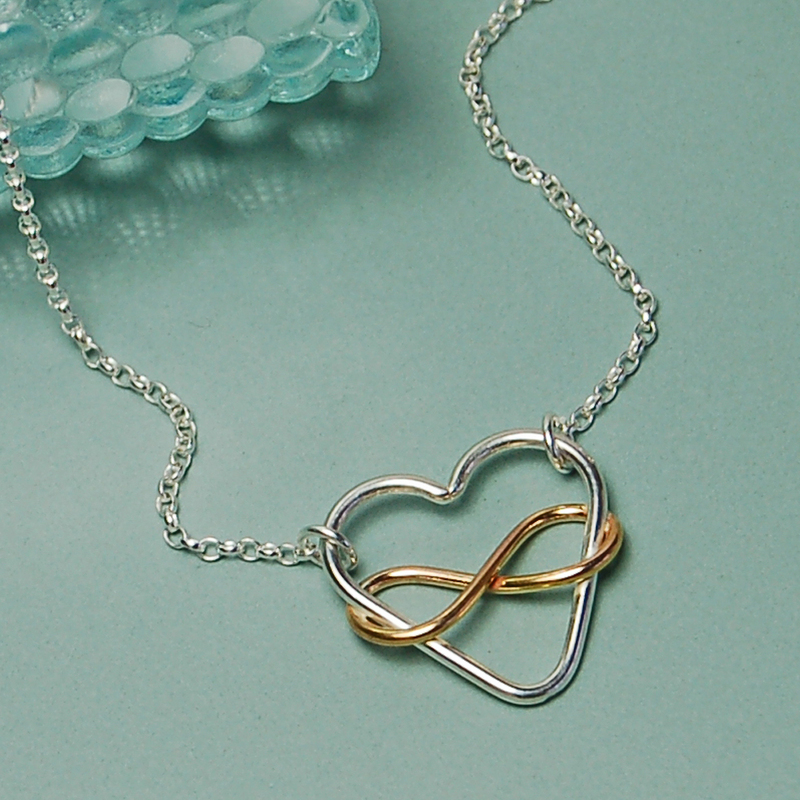 So enough with the waffle I hear you say, So I’m here to inform you about our new sterling silver heart and gold filled infinity necklace which is a lovely handcrafted piece of jewellery made by us for you. 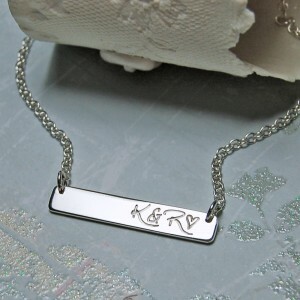 As you can see it has great meaning with the shapes used and would make a lovely gift for someone you hold dear to your heart. So first of all we make the infinity symbol from either 14k Gold fill or Rose gold, This can go wrong very quickly due to this necklace being about bends and it did drive me round a few while trying to make it! It may look simple but believe me it can be a trifle difficult as you have to get all your bends smooth and in the right place. Once we have this nice and correct and not forgetting equal then solder it together. 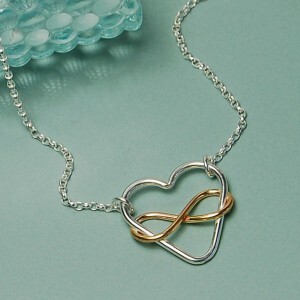 Then take your sterling silver wire and start to make the heart but before you bend the top parts fit the infinity symbol till it sits against the silver making sure its straight and then you can finish the top bends of the heart, once your happy it’s all straight and smooth in the bends then solder the middle of the heart together and Bing Bong Boo you have yourself a unique lovey- dovey necklace, Well we do! Shall have to add it to the BJA copywrite office lol. So after the hard work of cleaning, Polishing and then taking some photo’s of course and then not forgetting the actual process of making it as well which now I think about it, It’s a little bit harder than I make out!. So now that we have deduced that lets move on! Once made we decided not to solder a loop in the center of the heart but instead thought we would like to hang it by jump rings which makes the difference to the overall look. 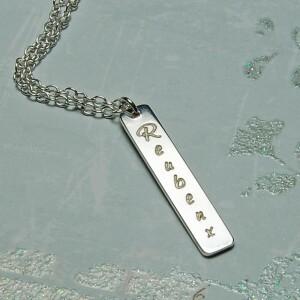 Now we love using this belcher chain which we have used on this necklace and others, Basically because it’s gives the delicate look but it’s very strong. So overall we love this piece and we hope you guys will to. Join us next time when I’m not quite sure what I will be blogging about but I’m sure it will be another IndiviJewel! So don’t be like the rest be an IndiviJewel – Just like us. Au revoir for now. So here we are again, Happy New year to you all, little bit late to say the least I know but it’s the thought that counts right? Well With the end of January already here upon us we have a lot of new products in the pipeline and some ready to go. 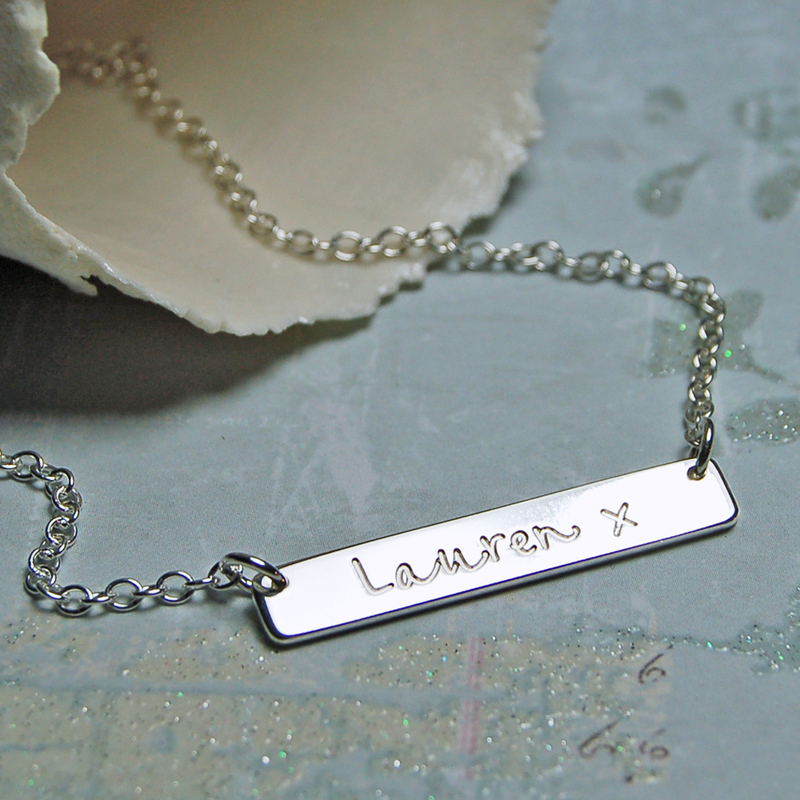 So here we have our new personalised bar necklace to tell you all about. For such a simple design it’s also a very modern, minimalist and elegant one. As you can see in the photo’s you can have a lot of variation with regards to the text and layout, also this type of design is great for personalisation as you have a bit of room front and back for the text or images. So on this particular piece we went for a sleek shape which is cut from a nice thick 1.2mm sterling silver sheet and we have used a standard size and shape but we can alter this if anyone wants to have something a little different just email or phone us or maybe even a carrier pigeon if you wish! As you can see we have used different fonts and types of text you can have so potential customers have an idea of what they can add, No stone left unturned here to help you guys decide what you need. As well as the horizontal design we have also given the choice to have it vertical (Yes I know we are just to good to you guys) which gives a whole different look to the same shaped piece. Both the necklaces are hanging from a lovely sterling silver belcher chain, Very strong but gives it that subtle look to keep in with the design. This necklace is one of those pieces that never goes out of fashion no matter what decade you like to be in so it’s great for any occasion. OK so I think I covered everything here but any questions please just send to us on a postcard! We will reply, Honest! So with Valentine’s Day fast approaching for all you love birds we have a new necklace to show you guys but that’s for another day so tune into the next instalment that is IndiviJewels, and Au revoir for now. Yes that’s right I’m multilingual too! 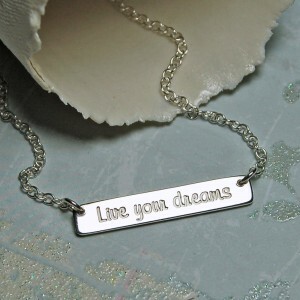 So why not be different from all the rest and become an IndiviJewel, Just like us.